Most important win in a tournament and most satisfying win in a tournament: 2004 Missouri State Doubles, Bill McGreevey and I defeated Chapman and his partner in two and then won the finals the next day. The first of three straight tournament wins with Bill. What are your goals in handball going forward: Stay in shape and not let a lack conditioning be the reason for a loss. 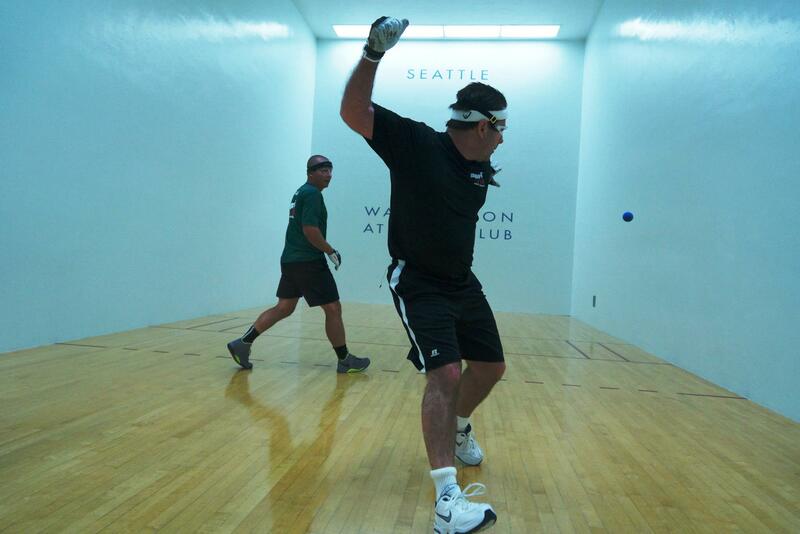 Thank to the WPH I am enjoying handball again and want to play as long as my body holds up. What are your goals for Houston and the SR48 season: Win. To quote Herm Edwards, “you play to win the game.” If I do not win, I want to be able to say that I played my best and left everything on the court. Favorite handball tournament: Anything the WPH puts together. How will you prepare for Houston: I have been preparing for three months. Have lost 20 pounds, been working out with a trainer to improve my leg strenth and speed on the court. What do you love about handball: The competition. Favorite pro player (now or ever): I really enjoyed watching Vern Roberts play as I grew up. He was as smooth as anyone on the court. How would you describe your game (aggressive, shooter, defensive, etc): I like to think that I can do it all, but I prefer to be aggressive and shoot the ball when the opportunity presents itself. What is your best shot (serve, fly kill, back wall kill, etc): probably my serve. Given the choice, what top SR48 would you most like to play: John Bike, we are 1-1. I won in Denver, he beat me in a very close match in Seattle. I want a rematch. I also have never played Andy Schad, that would be a lot of fun. Who has inspired you to play this game at such a high level: My Dad. Who do you think is the best player of all time: Probably Paul Brady. They guy can beat anyone with any ball. He can play with the Irish ball, the 21 ball and the R48 Ball and still destroy anyone in the game right now. I don’t recall any single player ever dominating at this level with this many different balls over a period of 7-10 years as Paul has done. Which current Race 4 Eight (not senior) pro would you have most liked to play in your prime? Paul Brady, would like to know if I could score.